For the past six weeks, I had the good fortune of living in Kiev, Ukraine. 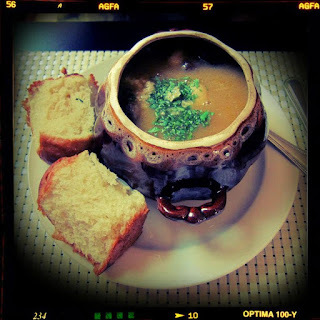 During this time, I was able to experience all that Ukrainian cuisine has to offer…and I must say, there is a lot! 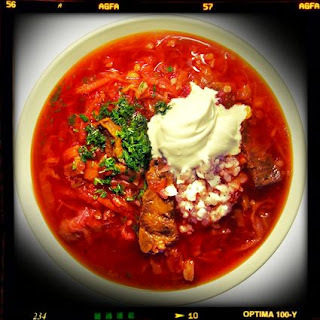 Ukrainian dishes have a sophisticated simplicity about them and often combine fresh, pickled and smoked ingredients. Their food is neither heavily spiced nor bland, but rather has the perfect combination of seasoning. Bread is of course the mainstay of the Ukrainian diet, which unfortunately has taken its toll on my waistline! Ukrainians also do love their sour cream! I was asked "Vy khotily smetanoyu?" at almost every meal, which means "would you like sour cream?" They top everything with it, whether it be breakfast, lunch, dinner, or even dessert. During my time in Kiev, I was able to try many different dishes, but I will only share with you my favourite ones! First up is the national dish of Ukraine…borshch. There are many different versions of this beet-based soup, which can contain as many as 20 various ingredients, depending on the season, region, and personal preference of the cook. I’ve learned that it can be meatless or prepared from a rich meat stock and contain either beef or smoked pork. The one that I thoroughly enjoyed had pork, beets, carrots, potatoes, cabbage, onions and of course, sour cream! It was absolutely divine! You definitely cannot come to Ukraine without trying it! Next up are varenyky…or as we Canadians call them, perogies. Varenyky are extremely popular in Ukraine, and you can get them just about everywhere. 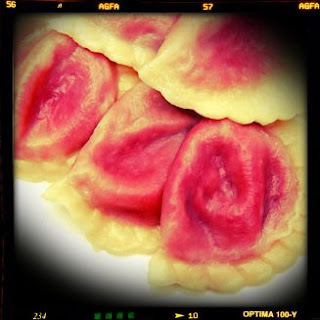 They are dumplings made from boiled or fried dough, resembling ravioli. They can be filled with meat, potatoes, cabbage or mushrooms and served as an entrée. I tried all of the various options, except the meat ones, and my favourite was definitely the mushrooms! Little did I know that you can also eat varenyky as a dessert! Unlike the hearty versions, the dough is filled with sour cherries or sweetened cottage cheese and raisins and accompanied by butter or sour cream. I treated myself once to the cherry varenyky, which were surprisingly tasty. 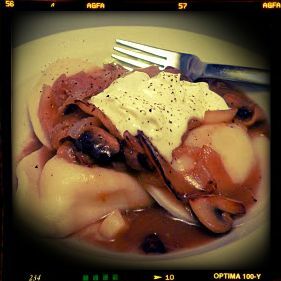 Who would have thought…perogies as dessert! My next challenge will be to make these in Canada! As a huge fan of beets, I really did come to the right country. It seems that Ukrainians also share my love of beets, as they can be found in a good majority of their recipes. 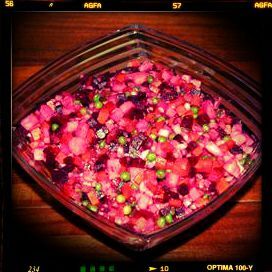 One of my favourite side dishes that I tried was vinihret, which is a red beetroot salad with peas, onions, beans and pickles. All of the ingredients are chopped up into little cubes, which I found quite pleasing to eat. 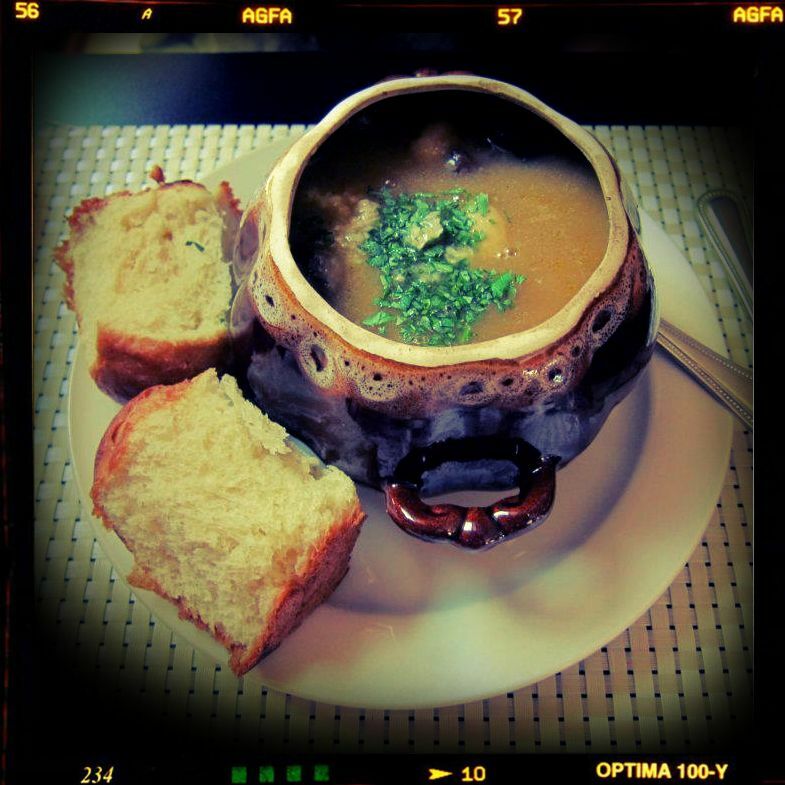 The traditional Ukrainian stew is also a must-try. Served in an individual-sized clay pot, it consists of stewed beef, carrots, potatoes, turnips and array of spices. There were also a few clumps of fat, but I didn’t go as far as to eat those. The dish was hearty and left my appetite completely satisfied. Another Ukrainian favourite of mine are deruny, also known as potato pancakes. They are shallow-fried pancakes of grated or ground potato, flour and egg, often flavored with onion or garlic and seasoning. They are topped with a variety of condiments, ranging from the savory (such as sour cream or cottage cheese) to the sweet (such as apple or cherry sauce or sugar), or they can also be served ungarnished. 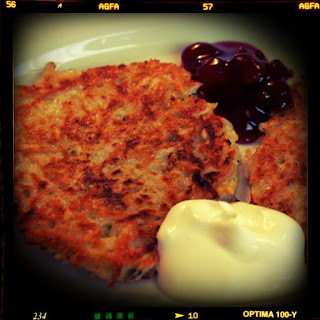 I tried mine with both cherry sauce and sour cream, and they were quite delectable. I have also been known to be quite obsessed with cabbage rolls back in Canada, or as they are known here, holubsti. Lola, who is of Ukrainian descent, often treats me to her family's homemade recipe. So as soon as I got here, I knew that I had to try the real deal. 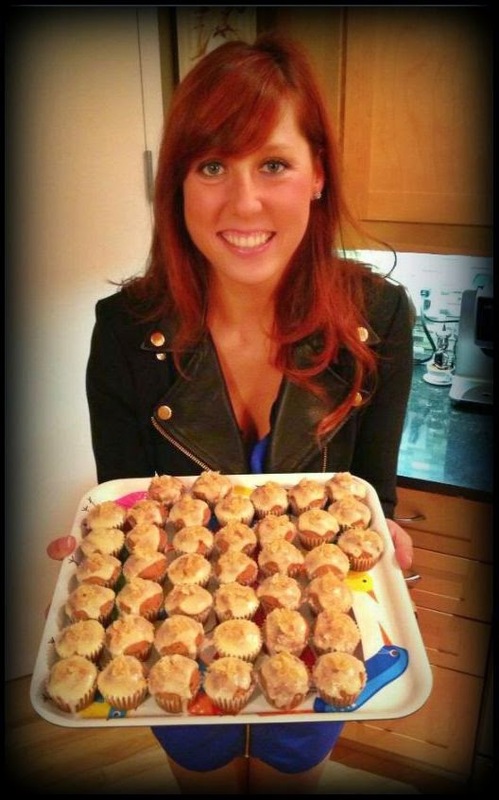 And just as I guessed, they were scrumptious. 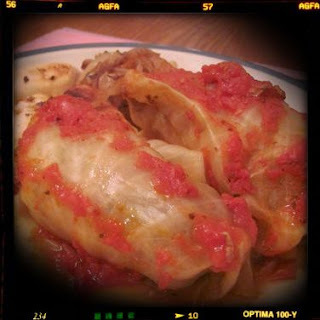 For those of you who have not had the opportunity to try cabbage rolls, they consist of cabbage leaves rolled up with meat and rice, which are often topped with tomato sauce and sour cream. For the traditional Ukrainian family, holubsti are an essential part of the Christmas Eve dinner. Now to quench my thirst, I also enjoyed Ukraine’s time-honored drink, kompot. 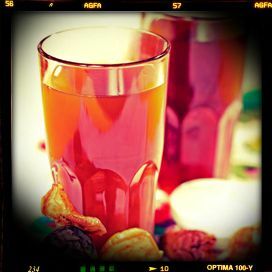 It’s basically a fruit juice that’s prepared by boiling dried fruit in a large volume of water, such as strawberries, apricots, peaches, apples, rhubarb, or sour cherries. It can be drunk both hot and cold, and it is often served with fruit sediments. I really enjoyed this beverage and found that it was flavoured perfectly. Last but not least, I have to say a little about Ukrainian sweets. I quickly became aware that Ukrainians are obsessed with Roshen candy and chocolate. Roshen is a Ukrainian confectionary, which you can find in just about every central square, mall or underground complex. It sells an array of candy and chocolates that can be bought in bulk, making it quite cheap. It is also here that you can buy the famous Kyivskiy tort. 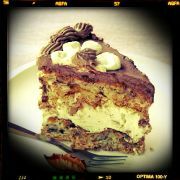 It is a tasty local specialty comprising of a layered cake made from crumbly raised wafers, hazelnuts, cocoa and cream. As I celebrated my birthday in Ukraine, this cake, which also serves as one of the symbols of Kiev, was a scrumptious addition to my birthday! While those are by far my favourite Ukrainian dishes, I also had the opportunity to eat in an authentic Georgian restaurant. My meal was so delicious that I couldn't pass up mentioning it! 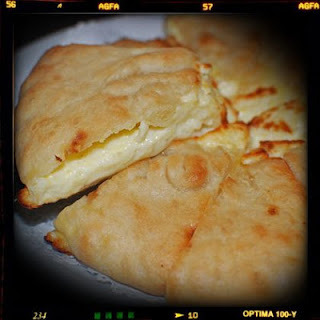 La pièce de résistance was of course the khachapuri, or cheese pie, which is the national dish of Georgia. It consists of hot flaky layers of buttery bread, which is filled with a mound of mouth-watering cheese. It is so good that it is sinful…and I definitely do not want to know how many calories are in it! But suffice it to say, if you ever have the opportunity to try it, you must, and just leave all of your healthy eating mantras aside! Well there you have it folks…the best of Ukrainian cuisine! As one who is very interested in the culinary art, I have to admit that I was extremely pleased with all of the food that I tried in Ukraine and I found their national dishes to be both wholesome and delicious! Thanks for kind words to our national cuisine.